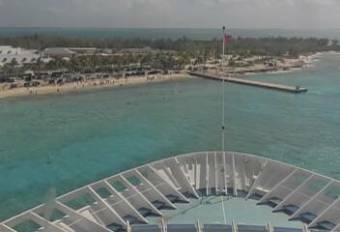 It's 09:28 on the Carnival Elation, Carnival Cruise Lines right now. View from the Bridge A view from the bridge of the Carnival Elation, Carnival Cruise Lines. St. Augustine, Florida: Marina, 38.6 miles away. Alachua, Florida: Santa Fe High School, 69.1 miles away. Flagler Beach, Florida: Beach View, 70 miles away. Daytona Beach, Florida: Volusia County Lifeguard HQ Admin Center, 89.4 miles away. Ponce Inlet, Florida: Sea View, 98.5 miles away. New Smyrna Beach, Florida: Volusia County EMA - Life Guard #6, 103.3 miles away. Valdosta, Georgia: Valdosta State University, 105.1 miles away. Beverly Hills, Florida: Vintage Garage, 115.7 miles away.